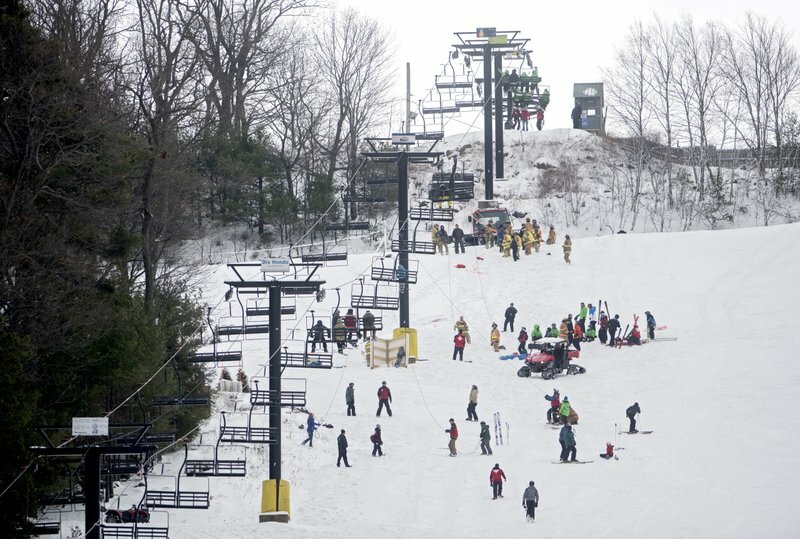 A ski lift malfunction on opening day at a Pennsylvania ski resort stranded dozens of people and left five with minor injuries. Around 10 a.m. Saturday, a chair carrying skiers and snowboarders slipped along the haul rope and slid backward into another chair, officials with Tussey Mountain ski resort in Centre County, around 82 miles northwest of Harrisburg, said. That caused a domino effect to several other lift chairs. Officials said the lift was stopped and the ski patrol and emergency responders started to evacuate people from the lift. The Centre Daily Times reported that emergency crews were lowering people with ropes. State College police Lt. Bradley Smail said he believed more than 50 people were stranded and it took over an hour to get everyone down. He said five had minor injuries. A Tussey Mountain spokesman said he didn’t know how many people were affected. Tussey Mountain, which opened for the season Saturday, said the equipment had passed tests by the state Department of Labor & Industry’s Bureau of Occupational and Industrial Safety Elevator Division. But officials said they have contacted the manufacturer to diagnose what caused the malfunction and would talk to “appropriate state agencies” before re-opening.